Founded in Tokyo sometime in the 1950′s Ichiko was a small Japanese tinplate toy maker who produced a nice range of quality tinplate vehicles. Although the company is still in existence today it ceased production of tinplate toys sometime during the mid – late 1970′s. 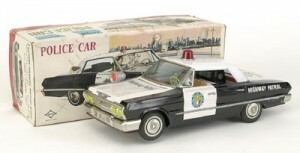 Battery operated Highway Patrol Car, based on an American Buick. 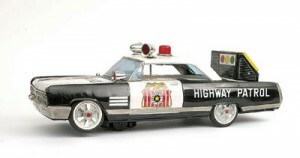 Tinplate vehicle in black and white colourway finish with police logos to doors etc., plated parts and detailed interior. ’Speed Meter’ to rear boot, roof lights, fitted with ‘mystery action’, 40cm. Friction drive Oldsmobile 4-door saloon in cream colourway finish with red roof. Plated parts including hubs with detailed tinprinted interior, 28cm. Battery operated model is fitted with ‘mystery action’. 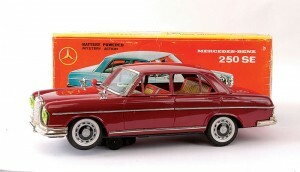 4-Door saloon in maroon colourway finish, detailed tinprinting to interior, plated parts including hubs, 35cm. 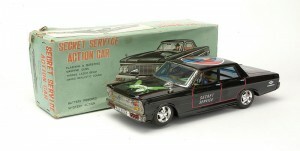 Battery operated model is based on a 1961 Plymouth Station Wagon complete with ‘mystery action’. Vehicle comes in silver bodywork finish in the livery of Radio-Televisione Italiana. 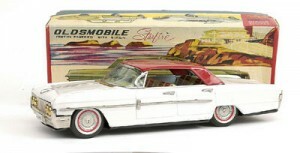 Fitted with roof rack, revolving plastic camera together with a TV cameraman figure. Tinprinted detailed interior, plated parts including hubs, 31cm. A group of battery operated 2 and 4-door American Saloon Cars. 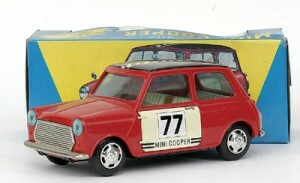 Models come in red / blue bodywork finish with detailed tinprinted interior and plated parts, 18cm. 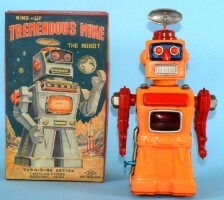 This page lists various Japanese tinplate toy companies and the trademarks they used. The list is by no means complete and as such will be ‘work in progress’ and will be continuously developing as and when I come across more information and the time to grow the site. At the same time I intend to expand the brief thumbnail description given on each company into a more rounded company listing to include pictures on the models they produced etc., at which point I will give that company its own page within the site. 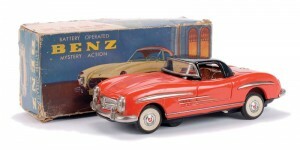 Formed in Tokyo in 1948 ALPS is generally regarded as producing some of the better quality tinplate toys throughout the post war years. Despite this success ALPS decided to change its emphasis in the early 1970′s and concentrate its efforts into the more profitable consumer and industrial electronics marketplace. For detailed company information, including product images, see my seperate completed ALPS page listing. Formed in Tokyo in 1950 its trademark logo had the letters of the company ‘ASC’ within a diamond. 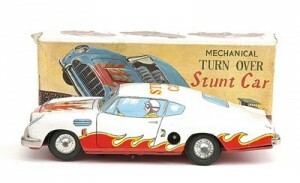 Although successful initially, when the market place changed from tin toys towards diecast in the 1970′s ASC switched to creating portrayals of animated and live-action heroes. For detailed company information, including product images, see my seperate completed AOSHIN page listing. 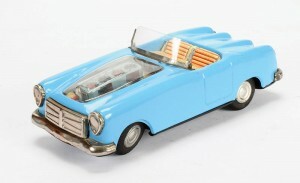 The Asahi toy company was founded in Tokyo in the late 1940′s, initially producing lithographed tinplate toys, but around 1959 the company became the first major Japanese company to produce a 1:43 diecast scale model range designed specifically for the Japanese home market. As well as producing tinplate and diecast toys the Asahi company also acted as the Japanese distributor for both Dinky and Corgi Toys. The first company trade mark was used from around 1948 until 1955 whilst the lower trade mark shown of a Santa figure was used from around 1955 onwards. Formed in Tokyo in 1950. Bandai had several trademarks over its lifetime, initially the one shown - the letter ‘B’ within an outer letter ‘C’ which represented ‘Bandai Company’. By 1980 Bandai was the major Japanese toy company and was to become the world’s third largest toy company. Although perhapse best known for producing the original version of the ‘Musical Jolly Chimp’ a toy that was to be replicated by various American, Japanese and Chinese companies Daishin also produced numerous tin toy cars many of which were battery operated. Formed in Tokyo c1950 Daiya was most active from the mid – late 1950′s through to the late 1970′s, after which time the company appears to have dropped off the radar. For detailed company information, including product images, see my seperate completed DAIYA page listing. 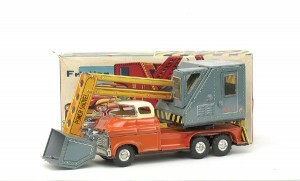 Formed in Tokyo in 1951 Haji was also known as the Mansei Toy Company. A small and relatively short lived toy maker producing a range of tinplate vehicles and tinplate novelties like ‘Strutting Sam’ a clockwork dancing figure. For detailed company information, including product images, see my seperate completed HAJI – MANSEI page listing. Formed in Tokyo in 1959 Horikawa, often thought of as a manufacturer of tin toys, is now believed to have been simply a reseller of products supplied by Metal House (Marumiya) which itself began life around 1943. Horikawa is best know for a prolific range of space toys noteably its space robots (Mr. Zerox, Attacking Martian, Fighting Robot) to name but three. Despite three decades of success Horikawa closed in the late 1980′s. For detailed company information, including product images, see my seperate completed HORIKAWA page listing. Founded in Tokyo in the 1950′s Ichiko was a relatively small Japanese tinplate toy maker who produced a nice range of tinplate vehicles. Although the company is still in existance today it ceased production of tinplate toys sometime during the mid – late 1970′s. For detailed company information, including product images, see my seperate completed ICHIKO page listing. 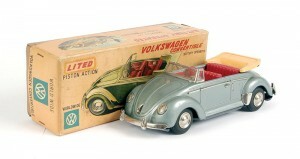 Founded in Tokyo, Kuramochi was producing a range of tinplate, lead and celluloid toys in the late 1920′s and early 1930′s and indeed Kuramochi was the largest supplier of Japanese toys prior to WWII exporting to both England and the USA where its products were distributed by the Geo. Borgfeldt Co. Following WWII two of its main employees left to form the Japanese toy companies of ALPS and Normura. Formed in Tokyo in 1947 Marusan was initially a wholeseller/reseller of mainly tinplate and optical toys. Its roots lay in an earlier company, Ishida Manufacturing, again producing tinplate and optical items and it was its founders two sons along with a third party who were to set up Marusan. The company name and logo derive from the Japanese ‘Maru’ = circle and ‘San’ = three. Marusan is now one of the oldest names in the Japanese toy industry. For detailed company information, including product images, see my seperate completed MARUSAN page listing. Masudaya was formed in Tokyo in 1924 and is widely regarded as the oldest of Japan’s toy makers. Masudaya was a leading manufacturer of tinplate toys, both mechanical and battery operated, in the post war era. Its logo incorporates the letters M-T and is often refered to as Modern Toys. 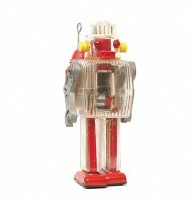 Masudaya produced a wide range of tinplate toys, aircraft, racing cars, military and civilian vehicles, motorbikes and space toys one of which was the classic ‘Radicon Robot’ in 1957, regarded as the first remote controlled robot. For detailed company information, including product images, see my seperate completed Masudaya Modern Toys page listing. 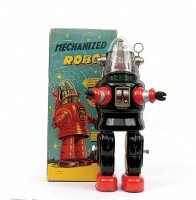 Formed in Tokyo in the mid 1940′s Nomura produced tinplate toys into the late 1970′s. The letters T-N within the logo means that the company is often referred to as TN – Toys Nomura. 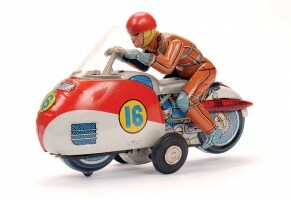 It was one of the biggest and most prolific of the postwar Japanese toy makers and produced a variety of mechanical and battery operated toys, military and civilian vehicles, novelty items and space toys. For detailed company information, including product images, see my seperate completed TN NOMURA page listing. Formed in Tokyo Yoneya, more than often referred to simply as Yone, used the trademark of a diamond lozenge around the letters SY pre 1964 after which the trademark was changed to incorporate the name Yone again within a diamond. 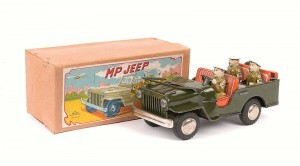 Yoneya produced a variety of tinplate toys including various novelty items like the Hippo Bank and several clockwork carousel type toys, military vehicles to include jeeps and tanks, civilian and racing cars as well as space toys and robots. Founded in Tokyo in the 1950′s Yonezawa, sometimes known simply as ‘Y’, was one of the most prolific of all post war Japanese toy makers. Its trademark was the letter ‘Y’ within a 5 petal stylised lotus flower. 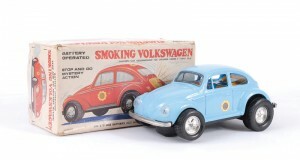 Yonezawa manufactured a whole raft of different battery and mechanical tinplate toys in various catagories before it ceased production of its toys sometime in the 1970′s.